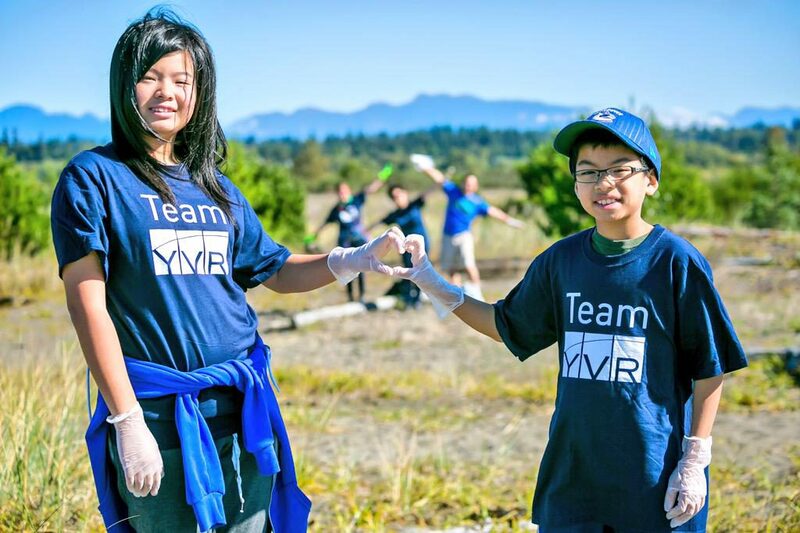 Every year, thousands of Canadians volunteer their time to protect our aquatic ecosystems from litter, and in turn, it is important for us to protect the volunteers on the shorelines and make their safety our priority. Before you head out to a shoreline near you, here are some tips to help you plan a successful and safe cleanup event. From a lake to a river to an ocean shore or a storm drain, a cleanup can happen anywhere land connects to water. 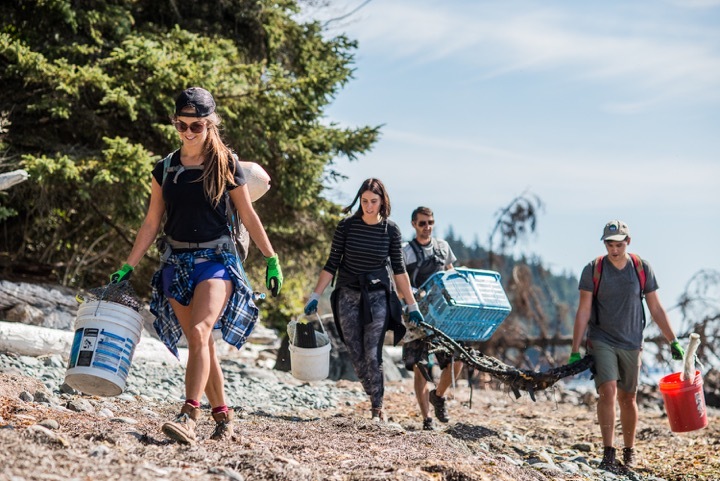 Check the Great Canadian Shoreline Cleanup registration map to find some suggestions for sites that have been cleaned in previous years. For the best cleanup experience, visit the site in advance of your cleanup day to familiarize yourself with the lay of land and note any potential unsafe areas We also encourage you to reach out to your municipality in advance to make sure you have permission to access the site as some may be private property or require a special permit. Now that you have a safe cleanup site, it is time to gear up for cleanup day. In addition to the basic supplies like garbage bags, litter data cards, pens and pencils, there are two must have items – gloves and proper footwear (no open-toed shoes). We also recommend preparing a first aid kit for emergencies and keeping a list of emergency contact numbers handy. And of course, pack some sunscreen and stay hydrated with a reusable water bottle. Photo courtesy of Ocean Wise. Must-haves for a safe shoreline cleanup? Gloves and proper footwear. 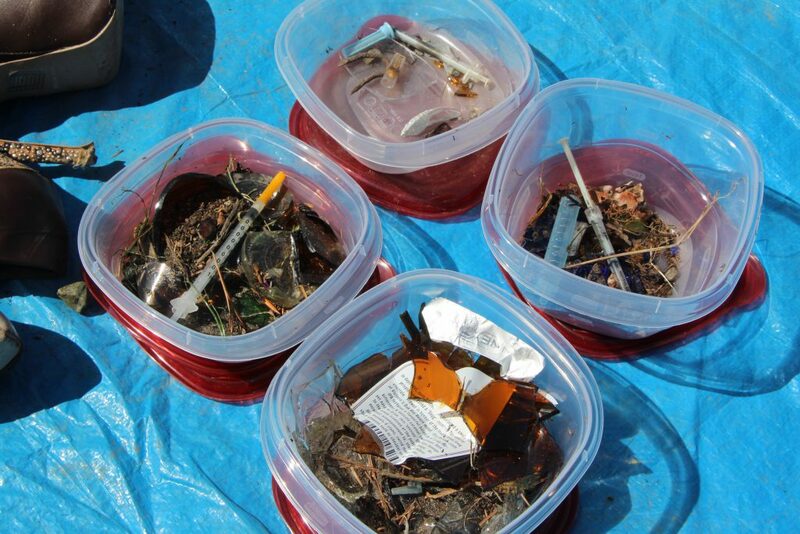 It is common for volunteers to come across sharp objects on the shoreline, including syringes and broken glass. Please remind your team never to handle these items with bare hands and to place all sharp items in a sharps container (a rigid container ideally made of metal or plastic). 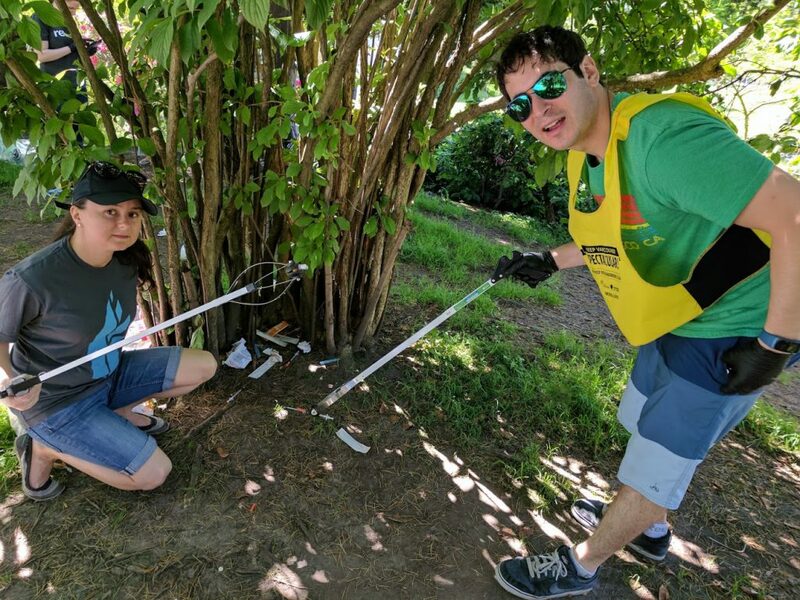 If you have youth volunteers in your group, make sure they know never to handle sharp objects on their own and to notify an adult if they come across any during the cleanup. Many local pharmacies offer a sharps disposal program and provide sharps containers for free. You can bring back the container after your cleanup and they can assist with proper disposable of syringes and other sharp objects. Place sharp items in rigid sharps containers made of metal or plastic. There have been concerns raised in certain urban areas with increasing cases of opioid incidents, noting the potential for volunteers to be accidentally exposed to fentanyl or other dangerous substances. We ask all volunteers to exercise caution and sound judgement and not pick up any hazardous items. The best approach is to mark down the area and notify local authorities immediately. Never pick up sharp items with bare hands. You might come across large pieces of debris on the shorelines that may be too heavy to lift by yourself. If it is something that a few team members can help lift together and bring back to your garbage collection point, please do so with caution and always lift from your knees to avoid back injury. If the item is too heavy, leave it at the site but notify local authorities so they are aware of the item and can arrange for pick up. Avoid picking up large items by yourself. Get the team to help or notify local authorities to arrange proper pick up of the items. Shoreline cleanups are meant to be fun for everyone and this is why it is important to keep safety top of mind for yourself and others on your team. If your cleanup is cancelled due to unsafe conditions at your site, please also contact the Shoreline Cleanup staff so they can make note of it and inform other groups who may want to lead a cleanup at the same location in the future. Should you have any concerns or questions, please contact us at shorelinecleanup@ocean.org or by phone at 1-877-427-2422 for further assistance. The following post was re-published from the Ocean Wise Aquablog. See the original post here.